With the angst building around Katy Perry and Lady Gaga's long-awaited releases, it seems as though the blogosphere was about to burst, taking sides on which diva's song would come out on top. 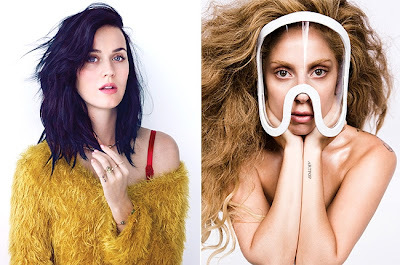 However, when both new singles--Katy Perry's "Roar" and Lady Gaga's "Applause"--leaked yesterday (Aug. 10), the divas decided to come together instead of butting heads. Katy Perry's tweet has since been removed. Lady Gaga's tweet was also referring to Katy Perry's promotional "Prism" truck, which crashed in Pennsylvania after being hit by a drunk driver on Aug. 9, according to the Daily Mail. No one was hurt in the incident. Whether the tweets were both genuine or an attempt to rile both fanbases for the new releases is unknown, but what is known is that by both stars acknowledging that they were aware of the leaks, the tension and excitement around "Roar" and "Applause" has only grown higher. "Roar" is scheduled to debut in full on Aug. 12 and "Applause" is scheduled to debut in full on Aug. 19. Katy Perry's new album, "Prism," is scheduled to debut on Oct. 22 and Lady Gaga's "ARTPOP" is scheduled to debut on Nov. 11.